It was a happy day when David, a dear friend from high school whom I hadn’t seen in 44 years (! ), came to Seattle on business in early August. We agreed to meet for a glass of wine at our condo in downtown Seattle, followed by dinner at a popular restaurant nearby. Barbara, another friend from high-school days, and her husband, also happened to be in town. So with my hubby, Spencer, it was a lively party of five. Those of you with an appreciation for good food and wine may know David from his luscious blog, Cocoa and Lavender, or from his wine posts at Provence WineZine. He’s also active on Facebook and Instagram, places where we originally rekindled our friendship. David was the first to arrive, and when I met him at the door, he surprised me with a Pike Place Market bouquet. “This is like bringing coals to Newcastle,” he admitted as he presented his prize. We hugged, and it was as if 44 years melted away in an instant. I nodded, found a pretty vase, and placed the bouquet in water for safekeeping. After a lively dinner over rivers of Rosé that encouraged rambling reminisces of our high-school days, I returned to the beautiful bouquet. As I cleaned and recut the stems, I mulled over how best to arrange it since I wanted to make David proud. 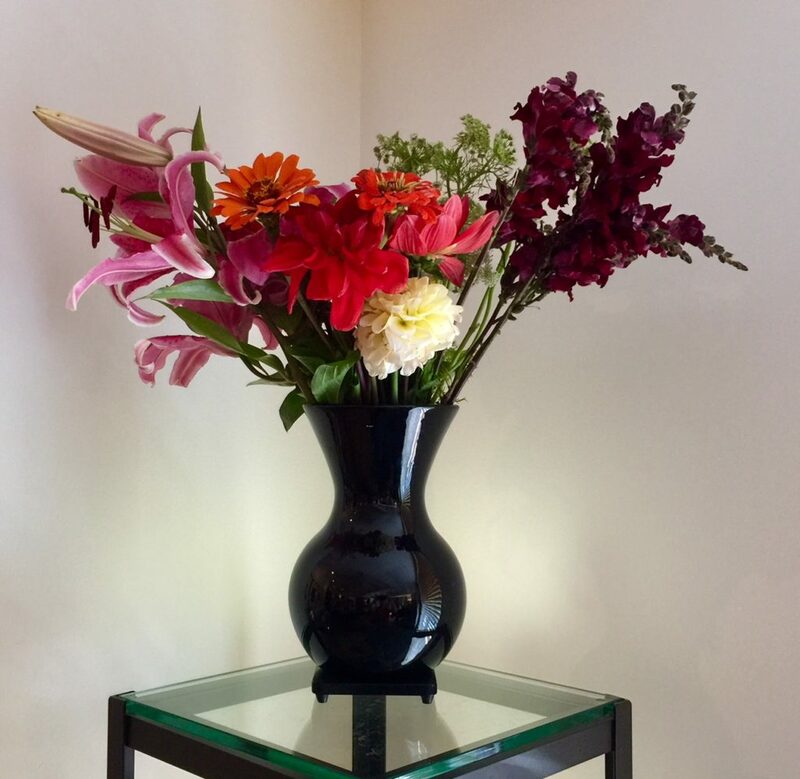 I had already decorated the condo with a plethora of Pike Place Market flowers in honor of David’s and Barbara’s visit (“coals to Newcastle”), so horizontal space was at a premium. Instead of creating half a dozen smaller bouquets, I decided to opt for one large one. I realize this goes against the underlying principle of the Bouquet-a-Week Project, but every once and a while you can break the rules. 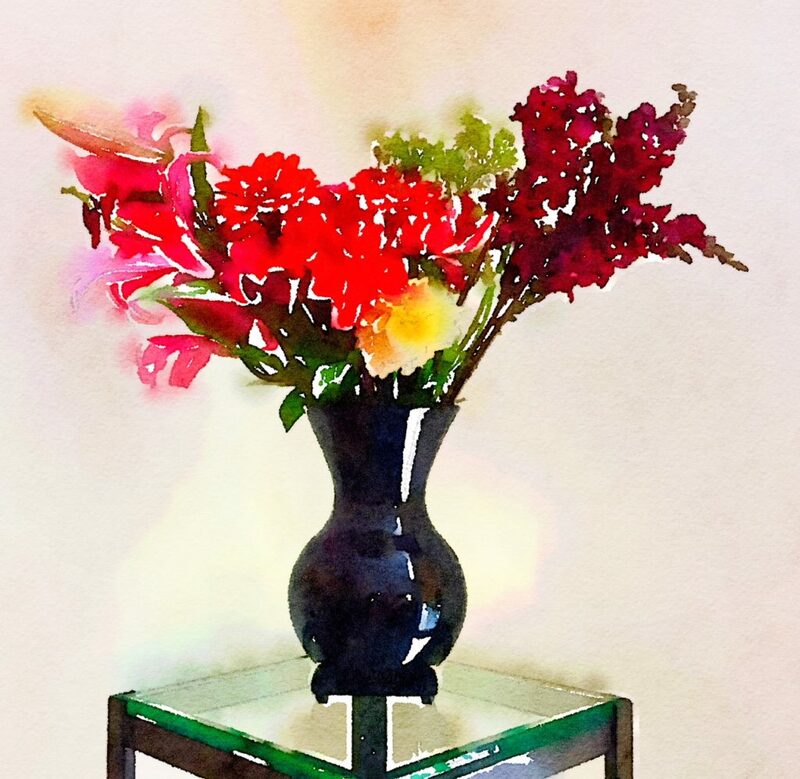 Here are David’s raw, rearranged Pike Place Market flowers from Week Twenty-Eight. And here are four different versions of the fresh flowers “painted” using the Waterlogue app. 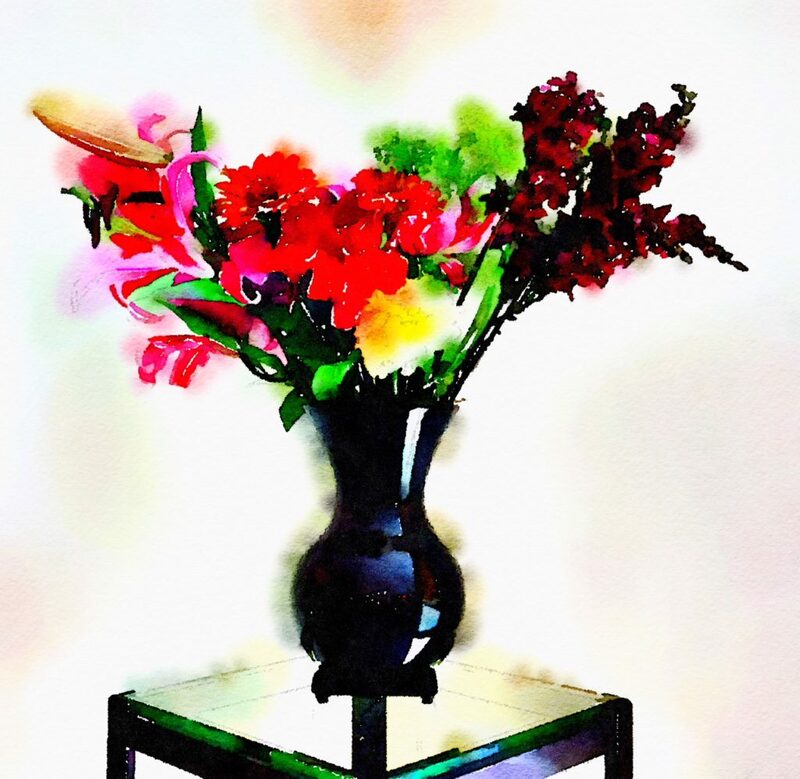 This is Waterlogue’s “Natural” mode, which (as the name implies) does the least amount of manipulation to the image. “Vibrant” mode amps up the colors just a bit. Things get crazy in the “Bold” mode of Waterlogue. It is often among my favorite looks. “Color Bloom” adds subtle white highlights, which creates another interesting effect. I was curious to see what David would think about the way I had rearranged his bouquet and which of the Waterlogue versions he would like best. He said it was a toss-up between the Bold and Color Bloom versions. But he particularly liked the Bold version because of the vivid green blossom in the back of the bouquet and the splashes of green from random leaves in the front. Barbara was more decisive, with a solid vote for the Color Bloom version. Which bouquet do you like the best? Which one speaks to your soul? How could I not love more than one? They are so beautiful!